opens up new opportunities to enhance mutual consciousness and appreciation for one another's diverse and rich culture." 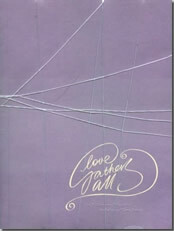 Filipino writers with poems in Love Gathers All include Jimmy Abad, Cesar Ruiz Aquino, Cirilo Bautista, Rofel Brion, Luis Cabalquinto, J. Wendell Capili, Noelle de Jesus, Ricardo de Ungria, Ophelia Dimalanta, Luis Francia, Eric Gamalinda, J. Neil Garcia, Christine Godinez-Ortega, Remé-Antonia Grefalda, Ramil Digal Gulle, Luisa Igloria, Marne Kilates, Rene Navarro, Jon Pineda, Danton Remoto, Nadine Sarreal, Eileen Tabios, and Rowena Torrevillas. more steadfast than this stone."